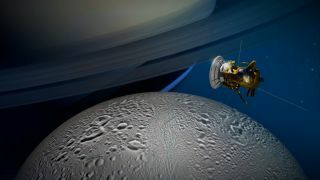 An artist's illustration of the Cassini spacecraft flying by Saturn's moon Enceladus. Data from Cassini has contributed to a new study that may narrow down the location of a ninth planet beyond Neptune. The search for a possible ninth planet, far beyond the orbit of Pluto, is being assisted by NASA's Cassini probe, which has been exploring the Saturn system for more than a decade. The news that a possible ninth planet with a mass 10 times that of Earth could be orbiting in the dark region beyond Neptune lit up the public's imagination in January. The prediction is still just that — a hypothesis, based on modeling, not observation. But the scientists behind the idea say telescope searches of the solar system could confirm (or deny) the prediction within five years. Researchers say an anomaly in the orbits of distant Kuiper Belt objects points to the existence of an unknown planet orbiting the sun. Here's what we know of this potential "Planet Nine." The Cassini probe is a space-based workhorse. It captures breathtaking images of Saturn, makes death-defying dives toward its moons and measures the precise location of Saturn at various times during its orbits around the sun. This latter information is plugged into a model of the solar system that tracks the movement of its largest bodies. Since the early 1800s, astronomers have tried to use the positions and motions of the known planets to infer the existence of invisible planets, according to a blog post by Mike Brown, a professor of planetary astronomy at Caltech, and one of the scientists who recently predicted the existence of Planet Nine. In some cases, the influence of one massive body on other massive bodies is obvious: that if the sun were invisible, the orbit of the planets around it would be a dead giveaway that something truly massive was living at the center of the solar system. This technique helped scientists discover Neptune in 1846, and Pluto in 1930. Brown and his colleague Konstantin Batygin, a professor of planetary science at Caltech, predicted the existence of Planet Nine by observing the peculiar orbits of six relatively large bodies in what's known as the Kuiper Belt, a loop of icy, rocky bodies that includes Pluto. Other scientists have proposed that the peculiar orbits of these Kuiper Belt objects (KBOs) could be explained another way: Perhaps there are significantly more small rocky objects orbiting the sun beyond Pluto than scientists currently estimate. In the grand scientific fashion, this trading of alternative possibilities continues. Ultimately, observational evidence should settle the debate, and Brown said that if Planet Nine is out there, scientists could reasonably detect it within five years. The new research could potentially expedite that search by pointing out regions where Planet Nine could not be orbiting and regions where it could. Agnes Fienga, an astronomer at the Côte d'Azur Observatory and a lead researcher on the new work, along with her colleagues, decided to look not only at how Planet Nine might affect bodies in its immediate area, but how it might influence the motions of the other eight planets. They used a computer model of the solar system called the INPOP planetary ephemerides model, which pulls together more than 150,000 individual measurements of solar system bodies, including more than 200 measurements taken by Cassini over about 10 years, Fienga said. That long-term observation of Saturn's motion is very important in increasing the precision of the model and its ability to pick up on the subtle effect of a possible ninth planet, she said. Brown and Batygin did not propose a specific path that Planet Nine would take through space but rather a possible range in which it could exist, about 20 times farther from the sun than Neptune is. The path of a planet around the sun includes how far it is from the sun, how oblong its orbit is (instead of a perfect circle) and how tilted its orbit is compared to the plane of the solar system. Fienga and her colleagues selected an orbit for Planet Nine out of the range suggested by Brown and Batygin, and added it to the INPOP model of the solar system. From there, they determined that the planet could not be in certain regions, because it would have caused perturbations in the motions of the other planets that should have been detectable by observations, like those made by Cassini. Fienga said she and her colleagues are working to perform the same analysis on more possible orbits of Planet Nine, to further narrow down regions where it could or could not be hiding. The effect of Planet Nine on the inner planets will be subtle, which is why Fienga and her colleagues could draw conclusions about only roughly half of the planet's orbit — the portion where it would be closest to the sun and, hence, the other planets. If Planet Nine were currently somewhere on the far side of its orbit around the sun, its effect would be too small for the measurements used in the INPOP model to predict. "It's a state-of-the-art calculation and a very clever idea," Batygin told Space.com via email. "It is wonderful to see that members of the community are presenting their own proposals on how to best optimize the observational search for Planet Nine. This is exactly what Mike [Brown] and I hoped for." Starting this year, the Cassini probe will begin a total of 22 dives through Saturn's ring system, ending with the probe intentionally plummeting into the gas giant's atmosphere in September 2017. Meanwhile, the Juno probe will arrive at Jupiter on July 4, 2016. Measurements by Juno will continue to improve the precision of the INPOP model. Fienga said she and her colleagues "expect to increase the size of the forbidden area thanks to Juno." The new work is available on the pre-print site arxiv.org, and will appear in an upcoming issue of the journal Astronomy & Astrophysics. Fienga and her colleagues are not part of the Cassini team or NASA.